SURRY HILLS SURRY HILLS IS QUITE SIMPLY, SURRY HILLS! Little Albion Guest House was created with the needs of today’s luxury travellers in the front of our minds, which are the authenticity of a local experience, alongside world-class boutique hotel service and ease of booking. To do this we had to redefine the whole hotel category by imagining a modern guest house, developed with the same attention to detail that a homeowner has in creating their dream home, resulting in this truly one of a kind property. 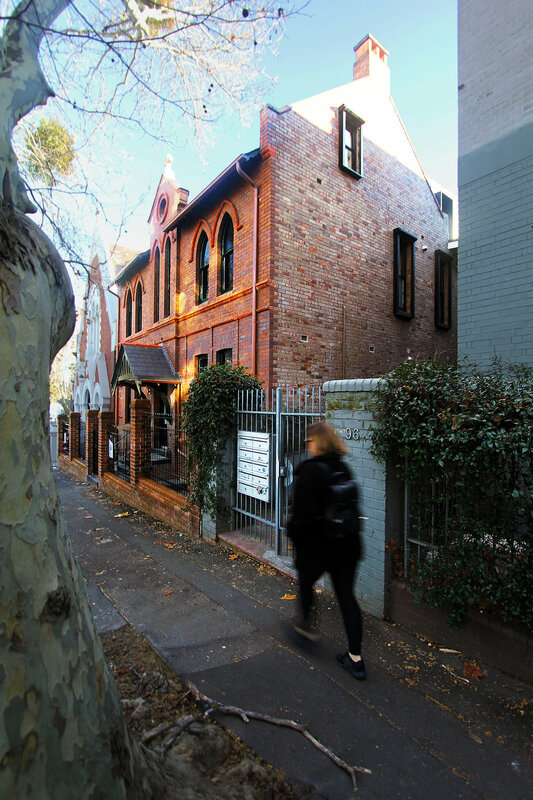 Situated in Surry Hills – a fine-grain, inner-city suburb in Sydney – is a heritage-listed former convent turned boarding house, turned boutique guest house. It fronts Albion Street (south) and Little Albion Street (north) – a once tired, dodgy laneway. There is a former church turned commercial office building (west), a former school hall turned mixed-use apartment building (east) and a substation (northeast). Besides maximising the site’s development potential, our Client – like a discerning modern traveller – wants a boutique guest house design that feels homely, local and authentic. The Council wants the integrity of the heritage building facade along the main street, and the presence of the former church along the laneway, maintained. 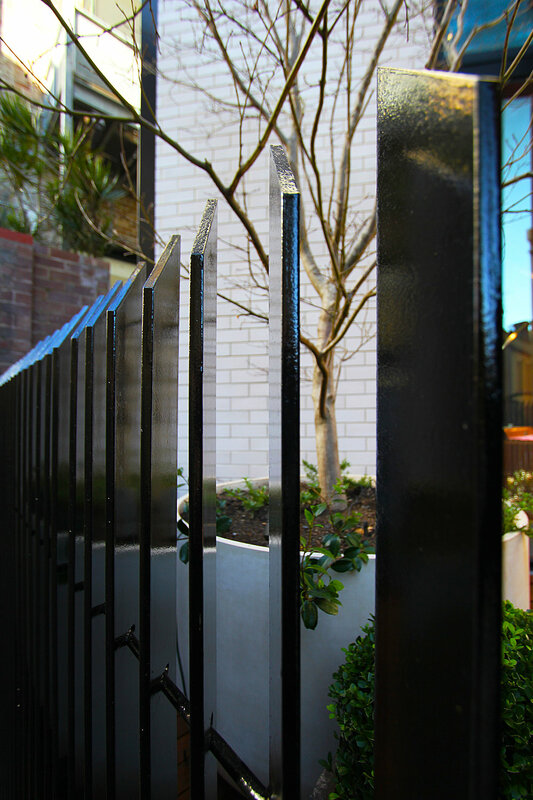 The neighbours are precious about their living amenities whilst the public yearn for a safer laneway. 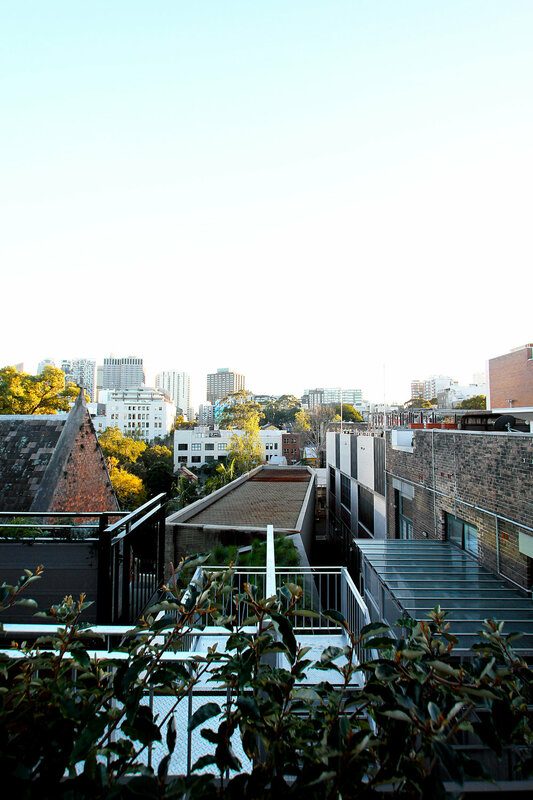 We listen to the stakeholders by creating a neighbourhood-centric architecture – humble and socially-connected; a microcosm and a storybook of Surry Hills – shaped by the notable characteristics of its heritage context and the local area alike. The once sleepy back is now the new active front! We restore and repurpose the heritage building into guest rooms, and discreetly hide the rest of the guest rooms in a white, brick-clad westward extension and dark, steel-clad southward and upward extensions. The new which is modest, sporadic and low-impact is embraced by the neighbours. …EXCEPT FOR THIS GUY – THE BOLD NEW NORTHERN EXTENSION! Reminiscent of Surry Hills’ traditional terrace housing typology, the white, brick-clad northward extension houses two more guest rooms, including a 4m-high reception and sunken lounge that open to a front yard and the main entrance. 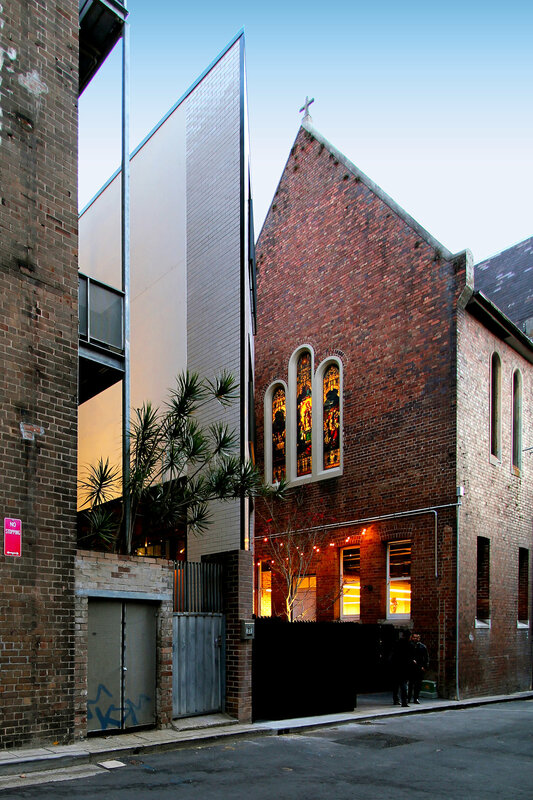 Thanks to the former church gable wall, it sits alongside a narrow, new-meets-old entrance courtyard with a perimeter outdoor bench seating that recreates Surry Hills’ all-too-familiar laneway experience. 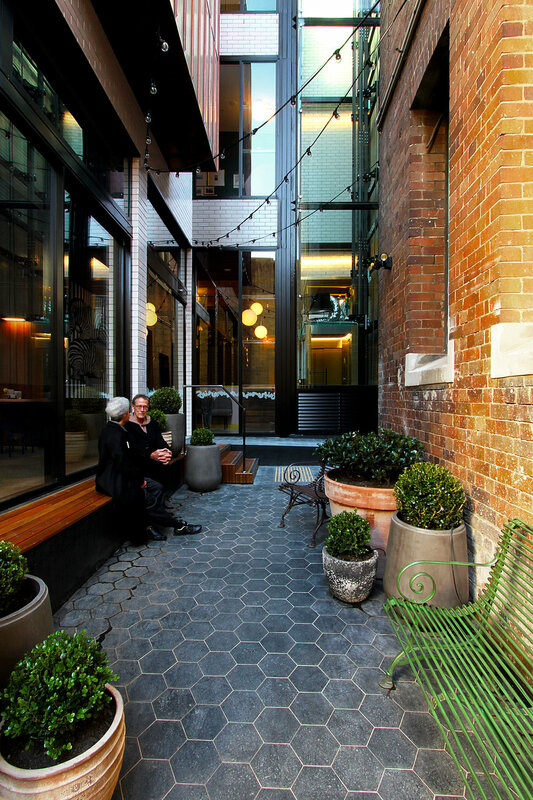 The back becomes an active front that engages with the community and reimagines the laneway as a welcoming pedestrian thoroughfare – an alternative urban prototype for an inner-city laneway gentrification. 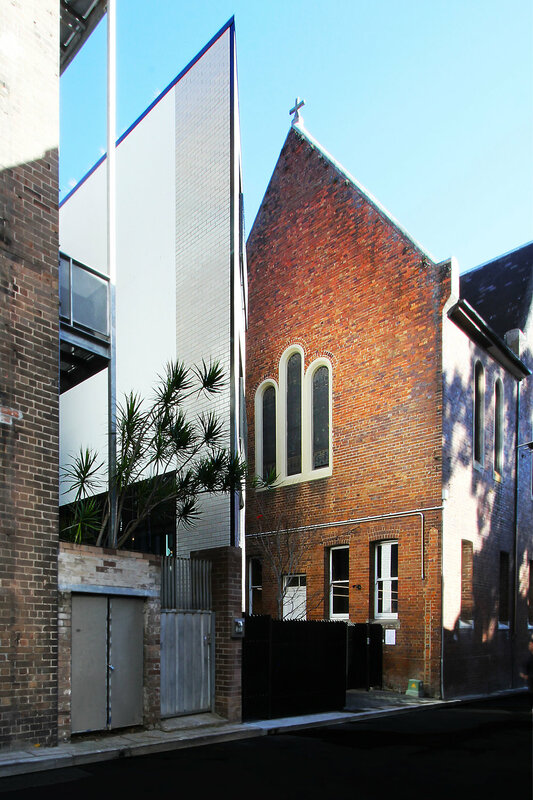 The acutely-angled wall celebrates the former church and ‘fuses’ both buildings, dubbed the twin peaks, into one. At the main entrance, it creates a dramatic welcoming gesture like a host. Looking northeast from the entrance courtyard, it points at the substation and ‘fuses’ both white, brick-clad edifices into one. NOW, THE HEART-STOPPING GLASS-STEEL LIFT TOWER! 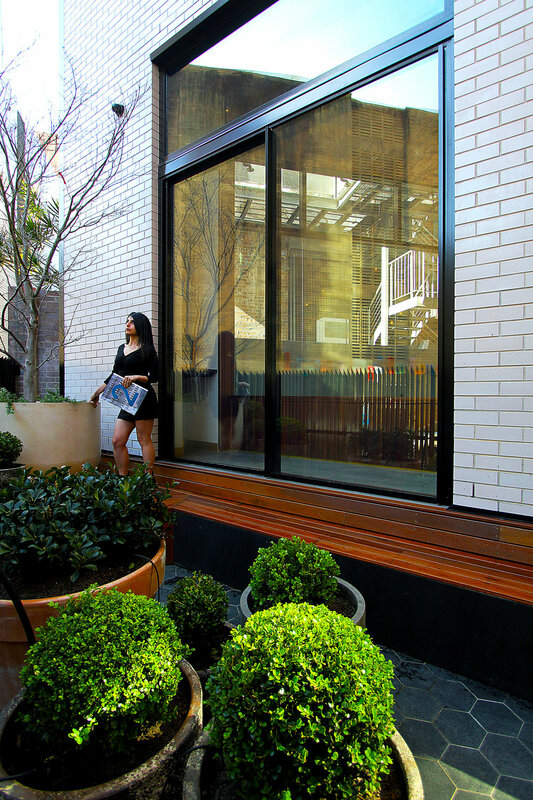 The attention-grabbing glass-steel lift tower is inspired by Surry Hills’ industrial past. 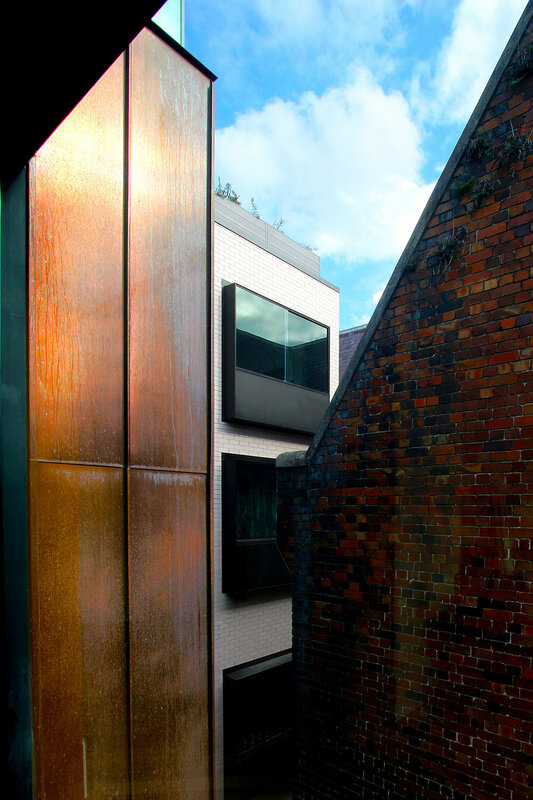 The copper-box projection and steel-flat Juliet balconies on the northward extension, steel-framed vertical windows on the upward extension and pointy palisade fencing at the new front take design cues from the heritage context. 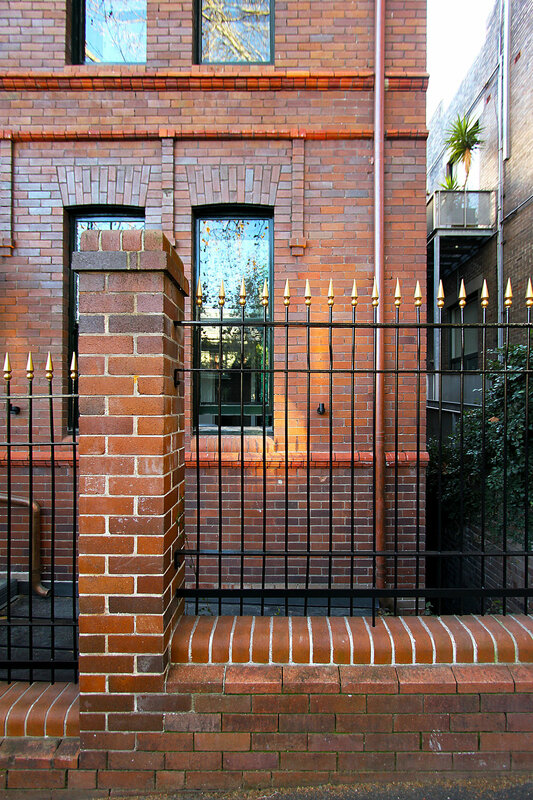 As bricks were once the main building block of Surry Hills for its proximity to the then brick pit called Brickfield Hill, the white bricks reference the rich local history whilst blending in and seemingly dematerialising into the neighbouring buildings by reflecting the surrounding lights and colours. They also form a clean backdrop for the colourful interiors, noticeably the red and green curtains that give each guest room a strong individual character. 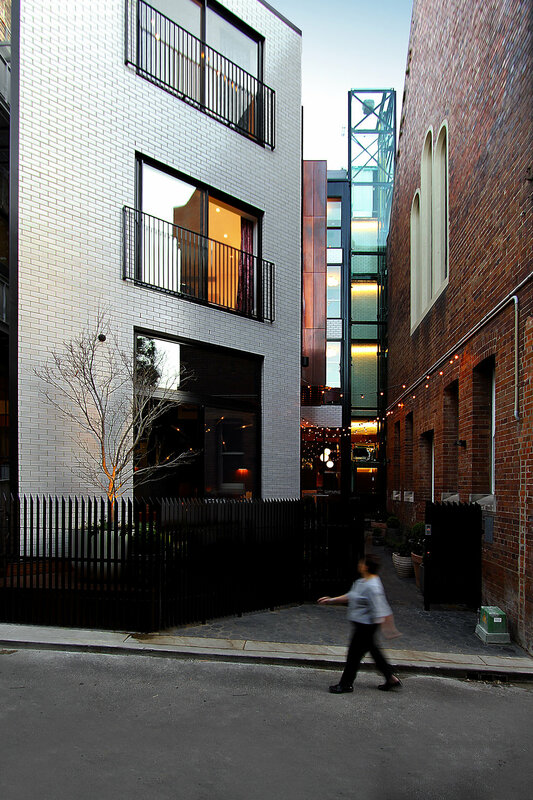 Despite the small, infill site limits the choice and variety of materials when construction logistics is concerned, a multifaceted, village-like design reminiscent of eclectic Surry Hills has been beautifully realised. It presents as a well-coordinated sequence of surprises and balanced opposites.